We arranged our drive for first thing on a Monday morning, and we drove out on Sunday evening to find the location of this so-called “Dream Garage.” We found the garage relatively easily, so then we stopped to watch some Mazdas, BMWs and an Evo X drive around cones in the parking lot of a karting track. That’s not really relevant to the story, but autocross is cool. 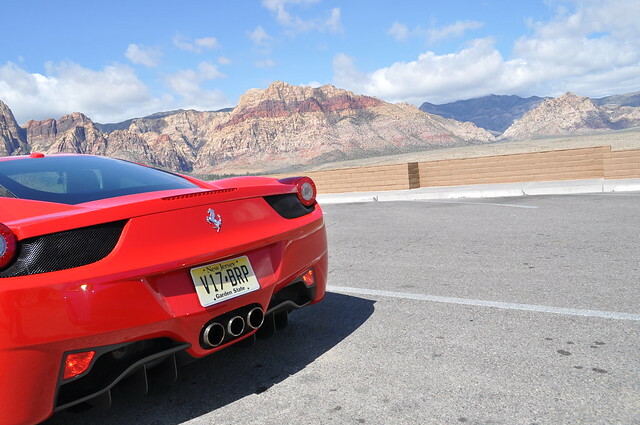 We arrived at the Dream Garage on Monday morning, where we were greeted by 6 absolutely gorgeous supercars sitting in the parking lot, and some people milling around. We were eventually ushered inside to fill out some paperwork and agree to the $10,000(!) deductible if we were to wreck a car and our personal insurance didn’t cover it. They took a copy of our credit cards so that they could get money off of us in the event that something happened. They apparently just assumed that everyone had at least a $10,000 limit on their cards. Finally we headed back outside to the cars. 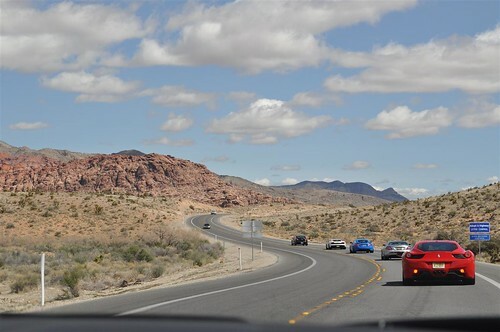 The format of the event is that there are 3 cars per group, and everyone rotates so that they get to drive every car in their group for awhile. Group 1 had a Lamborghini Gallardo, a Jaguar XKR-S, and a McLaren SLR. 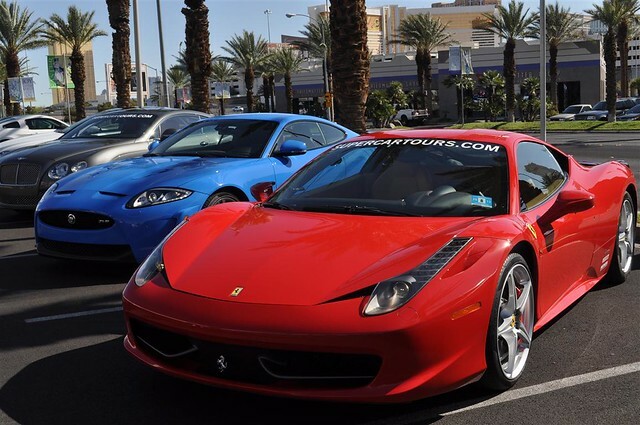 Group 2 had a Ferrari 458 Italia, another Jaguar XKR-S, and a Bentley continental GT (All automatic or DSG). We were in Group 2, and somehow, remarkably no one was crowding around the 458 so I happily jumped in the driver’s seat. It was a blessing in disguise that we were in the Ferrari first. 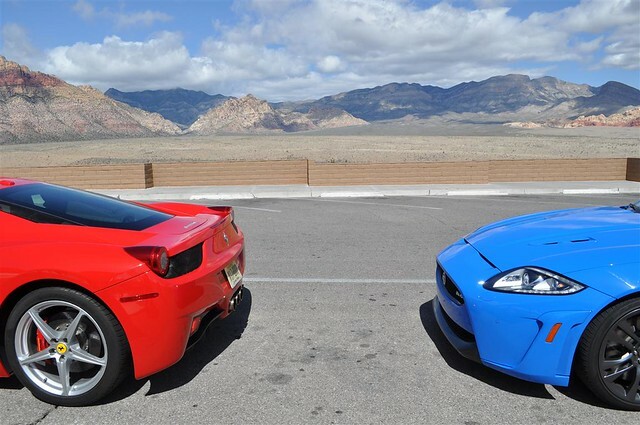 Since we were the first group of the day, we were faced with the task of driving the cars to the actual event location out in the desert, which meant driving a collection of supercars on the delightful highways of Vegas (and the associated fun acceleration that comes with merging onto highways with 562 horsepower at your feet). But before the highway, it meant some driving on city streets, where I could get used to the behavior of a DSG at low speeds. Have you ever seen the video where someone repeatedly stalls an Aston Martin One-77 and wondered how on earth someone stalls a (million dollar) glorified-automatic car? Yeah, it’s not really an automatic. The only way to describe it is that it feels very much like a manual, and when the revs get too low it behaves exactly like a manual. The Ferrari didn’t stall, but I could see how it might. So at low speeds the car was a little jerky, though I’m sure this would easily be overcome with some practice and learning how to feather the gas pedal the way you would a clutch. And then came the highway driving. Whoa. I’ve been writing this review in my head for months now, because really I have no idea how to do this car justice. They say that when you are really in tune with something (driving, flying a kite, etc.) it feels like the thing (car, in this case) is just an extension of your person, and the Ferrari definitely makes getting into that zone easy. Every input has a direct- correlation to what the car does. There is no unnecessary play in the steering, and the suspension isn’t rock solid, but you can get a good feel for the road surface below you. The gas and brake are expectedly the same way, and when you want it to go or stop it will do just that with no questions asked. 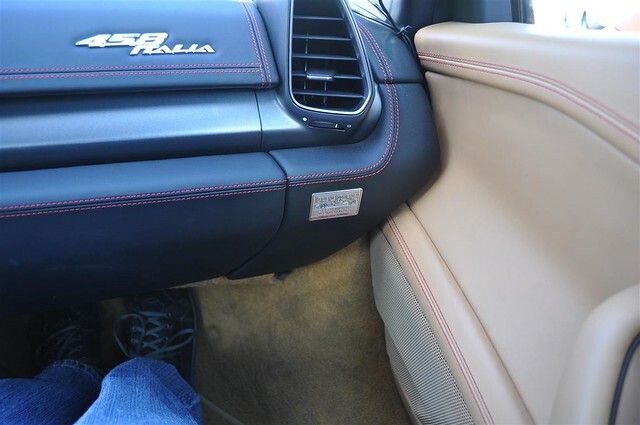 I just remembered this is a car review blog, and maybe I should talk just a little more about the car rather than go on at length about how much I love it. So then, the seats? They were cool. I love sport seats and bolsters that hug you (I think I’ve said this in a previous review). The interior was good, definitely not a bad place to be and everything was well arranged and made of quality materials, no rattles here! Unfortunately in such a short drive you don’t really get to play with climate control and other settings, but the important gauges were all easy to read. The tachometer is front and center and yellow, along with a display showing you what gear you’re in, and it gives you tips saying when it thinks you should shift into another of those 7 available gears. Downshift is automatic if needed to prevent stalling, or you can do it yourself earlier to make the engine make fun noises. The speedometer is off to the right and is a digital display, and sometimes this display is instead a navigation screen in which case you just get a digital speed reading (no dial, just a number) on the left screen. I don’t remember looking at the speedometer much when driving it (and I think Ferrari expected this when designing the car) but this could be a slight problem if this is a car you drive often and you live in a town full of police. There are also so many other fun things to say about this car, but I don’t want this review to go on all day, and others have already covered them more in depth than I ever could. Follow that link if you want more specs and to hear about all the interesting tech in this car. My personal favorite is the front wings that are optimized to funnel air into the radiators (no intercoolers here), but at high speeds actually shift to reduce drag. How cool is that?? Also, both the paddle shifters and the turn signals are on the steering wheel. It was slightly embarrassing in the beginning just how often I changed gears when trying to change lanes, and signaled when trying to change gears. The last problem is that the steering wheel is very F1 inspired with lots of buttons and gadgets, all guaranteed to make the car go zoom, but we were instructed not to touch them.